- Share this experience with friends! Round-trip airfare from your city to Cape Town, coach bus transportation within South Africa, three meals per day, lodging as per the itinerary, entrance fees, and a professional guide from arrival to departure. The dates you are planning for your group to make this pilgrimage (e.g., "January 11-19, 2020" or "Summer 2021"). Please give your closest major airports (e.g., "Dallas", "LAX", or "Baltimore & DC"). Please see the bottom of the page for destination details. Depart from home for your South African cultural adventure. After breakfast, travel to Springbok and Concordia for 2 days of volunteer work at a local organizations in need of helping hands. After breakfast, check-out of your accommodation and transfer to the airport for your flight home, carrying with you memories that will last a lifetime. Mass will be celebrated daily within the itinerary. Specific locations and events are subject to change within the itinerary depending on actual travel dates. Cape Town is the second largest city in South Africa, home to the South Africa parliament, and the capital of Western Cape Province. It is a world-class cosmopolitan city with numerous sites of historical significance. The Cathedral of Cape Town is St. Mary's. Formally known as St. Mary of the Flight into Egypt, the church has a history that reaches back more than 165 years to its founding in 1851. Robben Island is located in Table Bay, 6.9 km west of the coast of Bloubergstrand, Cape Town, South Africa. The name is Dutch for "Seal Island." Robben Island is roughly oval in shape, 3.3 km long north-south, and 1.9 km wide, with an area of 5.07 km². It is flat and only a few meters above sea level, as a result of an ancient erosion event. The island is composed of Precambrian metamorphic rocks belonging to the Malmesbury Group. Robben Island is where political prisoners were held before the fall of apartheid, including: Nelson Mandela, Nobel Laureate and former President of South Africa; Kgalema Motlanthe, former President of South Africa; and Jacob Zuma, current President of South Africa. 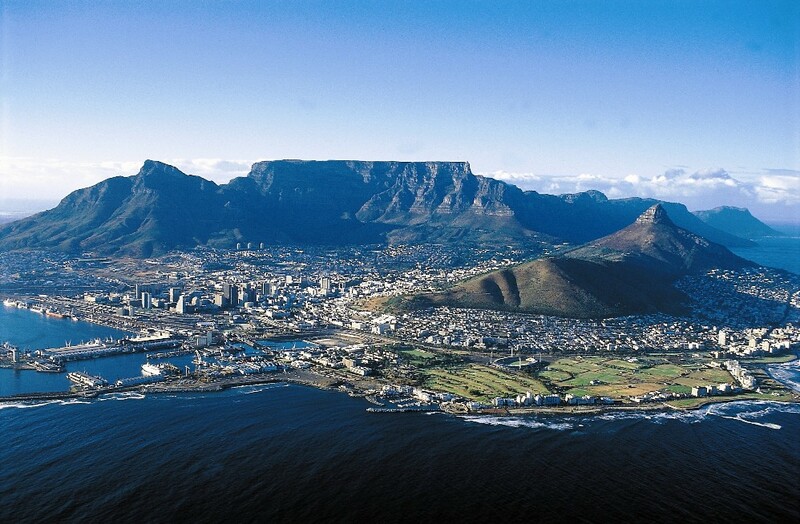 Table Mountain is the most iconic landmark in South Africa. A flat-topped mountain overlooking the city, Table Mountain is featured in the Flag of Cape Town and other local government insignia. Although the mountain boasts more than 350 trails to the summit, most visitors choose to take a relaxing cable car ride to the top where stunning views of Cape Town await! Leliefontein means 'lily spring' after the natural spring that is the reason for the town's origin. At first glance Leliefontein is little more than a smattering of simple, square houses, most of them facing east to ward off the westerly winds that sweep through here. The town started out as the kraal of a Nama chief, called Wildschut (wild shot), after which it became a Methodist mission village, and was known as a 'colored reserve' during the apartheid years. Now, the historical village is at the heart of the town, where cooking, dancing, and lodging is provided by local women in an immersive cultural experience. Namaqualand National Park presents a tapestry of brilliant colors, unfolding enticingly along its winding roads. Butterflies, birds, and long-tongued flies dart around among the flowers, seemingly overwhelmed by the abundance and diversity. Every turn in the road paints an unforgettable picture: valleys filled with Namaqualand daisies and other spring flowers that pulse with sheer energy and joy. Next to some eye-catching succulents, a porcupine and a tall aloe pay witness to a baboon overturning a rock and pouncing on a scorpion. During early August and September, seemingly overnight, the dusty valleys of Namaqualand are transformed into a wonderland, carpeted with wildflowers. With its winter rainfall, Namaqualand is home to the richest bulb flora of any arid region in the world and more than a 1 000 of its estimated 3 500 plant species are found nowhere else on earth. The rigorous climate has created a myriad of life forms superbly adapted to their specific habitat. Fields of flowers, star studded nights, quiver trees, enormous granite outcrops, and the icy Atlantic are but a few wonders that await the visitor to what is truly God's playground. The Orange River's Richtersveld section stretches from Noordoewer towards the Fish River confluence. It is 680km (approx. 425 miles) due north from Cape Town, and 1300km (approx. 810 miles) from Johannesburg - and worth every kilometer! The Richtersveld National Park, through which the river runs, is one of the largest mountain deserts in the world. More than half of the plants here are native to the region, and support a wide variety of fascinating animal and insect life. The banks are lined with willow and ebony trees which provide shade and shelter to river rafters, and forming an oasis green band of life through the orange splendor of this semi-desert.